NiMH battery for the FrSky Taranis transmitter. This low self discharge (LSD) 2600mah battery is specially made for Aloft Hobbies. FrSky originally supplied the Taranis with a 800mah battery, then they offered the 2000mah battery. 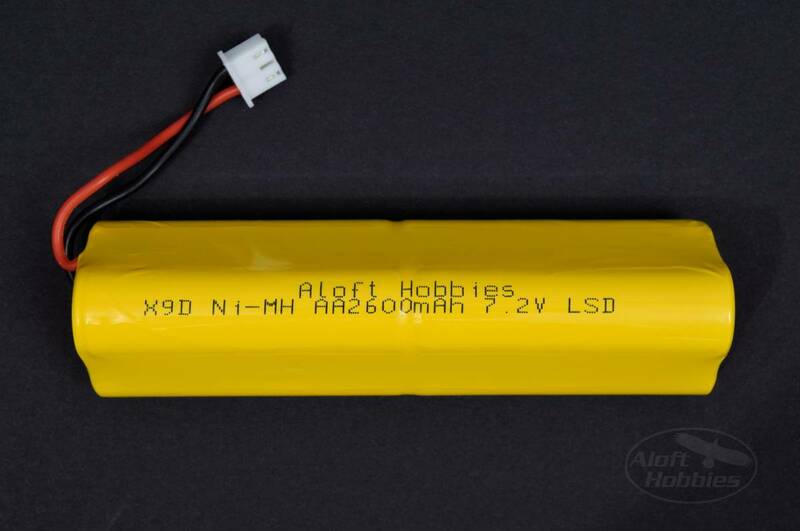 Now Aloft Hobbies offers you a 2600 mah battery using low self discharge cells (LSD). LSD cells maintain their voltage for long periods between charges, charge it today, and fly it in 6 months. Please note that early Taranis owners may need to run their charge cycle twice when first charging this battery, or when charging a deeply discharged pack. To do this, simply wait until the charge light turns off on your transmitter, then turn the Taranis on, and then off. The charge light should light back up and start charging again. Radios made from October 2013 on will not have this issue.